Ariel Helwani has broken some pretty substantial news. The ESPN reporter tweeted that despite the UFC 230 main event rumored to be Alexander Gustafsson vs Jon Jones 2 we aren’t going to get it. Instead he dropped a name no one saw coming. Jon Jones will have been just barely off his suspension before the event takes place on November 3rd and maybe the UFC feels like it’s too soon, or Jon just won’t be ready. We really don’t blame them. If something happened and Jon’s suspension was reinstated or an injury occurred they would have to scramble for a main event again with someone to match Jon’s star power, or find an opponent who would be perceived as a threat. It’s a nightmare scenario for the company especially since it’s going down at Madison Square Garden. 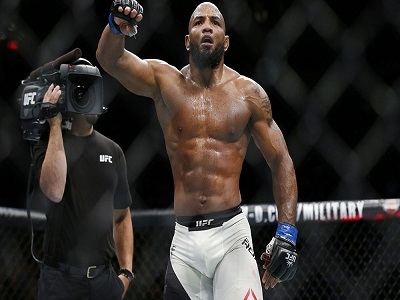 Gus is 3-3 in his last six and Yoel Romero has lost 2 times in his last 3 outings. Still, the name recognition, Gus’s popularity, and the excitement of Romero fighting at 205 might sell more tickets than we think. The rumor is that Jones would get the winner but it is still up in the air on whether a belt, official or interim, is going to be on the line for Gus vs Romero. What do you think? Would you want to see this?